Nevada Day—or Admission Day, as it was first known—was only periodically recognized for the first seventy-five years of the state's history. Parades in larger cities, such as Reno and Virginia City, were often held on important anniversary years. Other than that, little was done to mark the occasion. Admission Day was finally declared a judicial holiday in 1891, and a one-time public holiday in 1914 in observance of the 50th anniversary of statehood. The holiday was rechristened "Nevada Day" in 1933 and became a permanent official state holiday in 1939. The beginning of Carson City's annual Nevada Day parade is due, in large part, to the leadership of District Judge Clark J. Guild. As president of the Carson City Lions Club, Guild successfully mobilized businesses and average citizens in support of an annual statehood celebration. 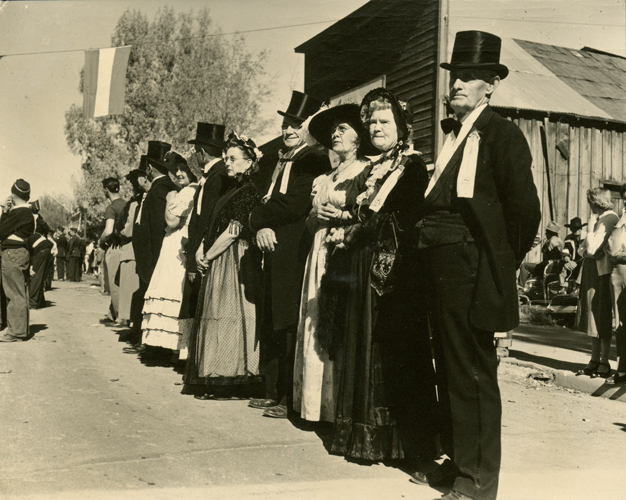 The first Nevada Day celebration was held in Carson City on October 31, 1938. The initial celebration included a historical pageant, a parade, a Civil War-era costume ball, and a "pony express" race from Virginia City to Carson City. Almost 19,000 were in attendance. By the following year, the event had expanded to three days, and attendance had increased to 45,000. In subsequent years, the size of the celebration has ebbed and flowed due to various political, social, and economic factors. Nevada Day has remained an important tradition, not only among the state's politicians and other leaders, but among its citizens as well. All photographs courtesy of Special Collections, University of Nevada-Reno Library. Man dressed as Kit Carson (standing with gun) for the first official Admission Day Pageant in Carson City, Nevada, 1938. The pageant was a Works Progress Administration (WPA) effort involving over 600 participants. Over 1000 people attended the ceremony. Native American dancers during the first official Admission Day Pageant in Carson City, Nevada, 1938. Prior to 1938, sporadic Admission Day celebrations had been held on and off in Reno and Virginia City. As president of the Carson City Lions Club, District Judge Clark J. Guild led the effort to make the celebration a regular annual event. 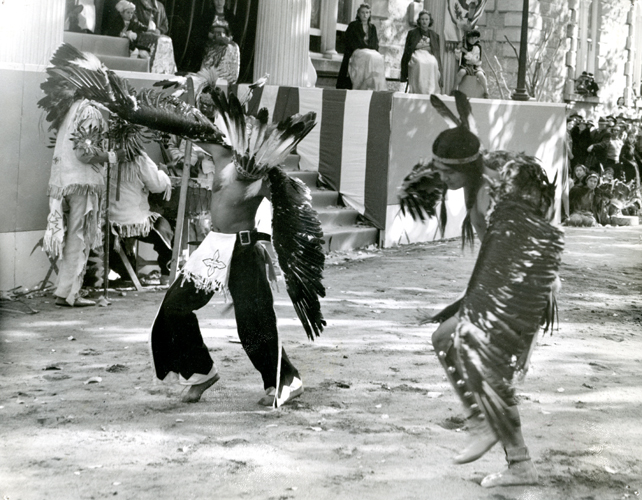 Native American dancers during the first official Admission Day Pageant in Carson City, Nevada, 1938. The purpose of the Admission Day Pageant was to tell how the state had grown and changed over the course of its history through the people who lived in and explored its territory. Included in this particular year's event were historic portrayals by members of the Nixon Indian reservation and the Stewart Indian School. 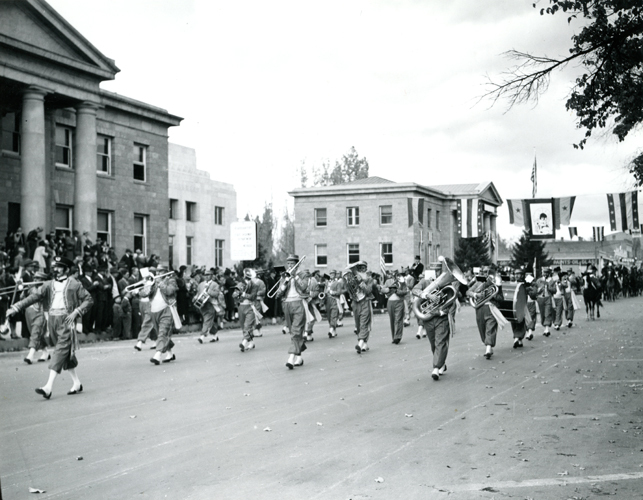 The Carson City Band performing during the first official Admission Day Pageant in Carson City, Nevada, 1938. Admission Day organizer and District Judge Clark J. Guild also successfully used the Band to raise funds to start the annual celebration, having them play for donations in such places as downtown Reno's Powning Park. Man dressed in Union soldier attire at an Admission Day event in Carson City, Nevada, date unknown. Dressing in period costume was a regular part of the Admission Day celebration for both event participants and spectators. 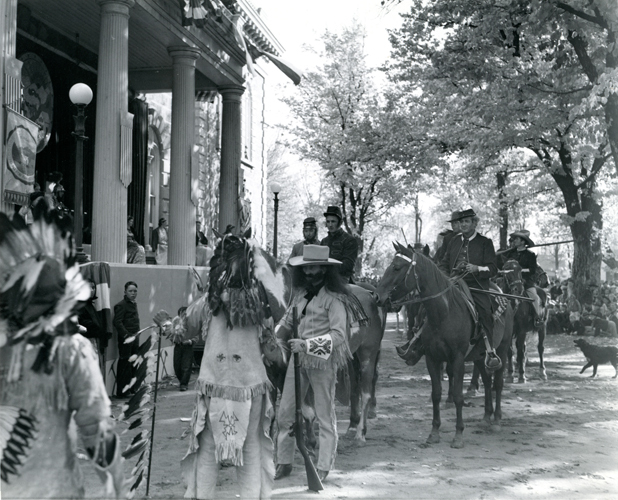 Costume contest at an Admission Day event in Carson City, Nevada, date unknown. These couples are dressed in mid-nineteenth century formal attire, possibly in preparation for the 1864 Costume Ball, which was a regular part of the Admission Day festivities for many years. 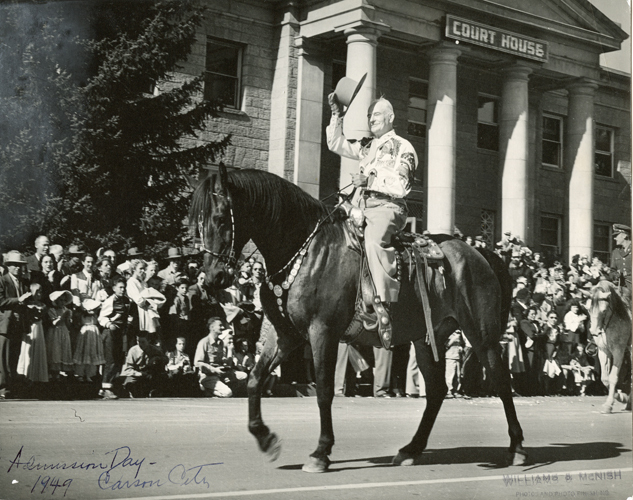 Governor Vail Pittman on horseback during an Admission Day parade in Carson City, Nevada, 1949. Governor Pittman led the parade that year, which featured 8 marching bands, between 40 and 50 floats, and 200 University of Nevada ROTC cadets. 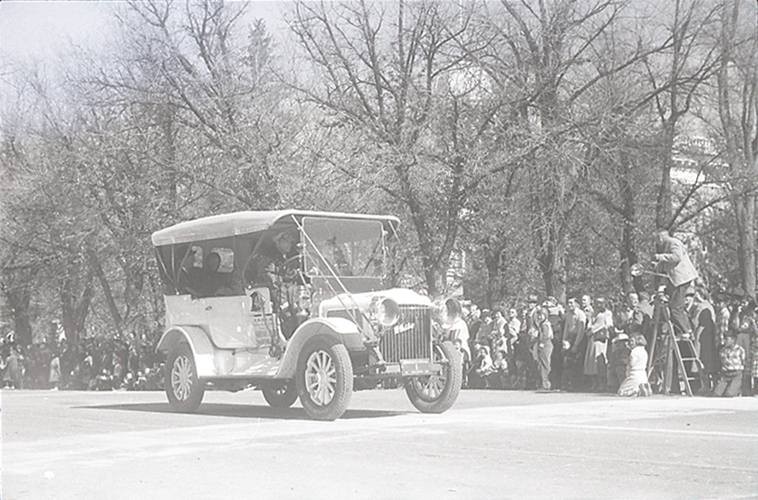 Antique automobile at an Admission Day parade in Carson City, Nevada, 1949. "Spectacular" is the word that the Reno Evening Gazette used to describe the Harolds Club entry in that year's parade. It included, among other things, this classic automobile, featuring the Harolds Club logo prominently on the front. 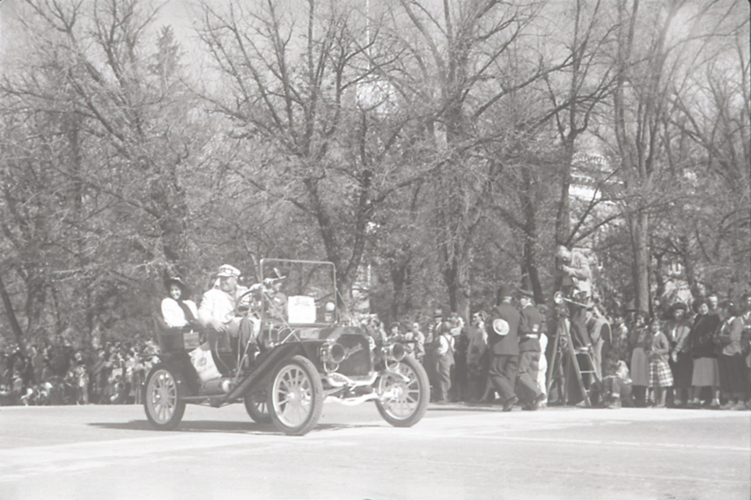 Antique automobile at an Admission Day parade in Carson City, Nevada, 1950. In 1949, Harrah's casino began displaying various pieces from the company's "horseless carriage" collection in the annual Admission Day fete. 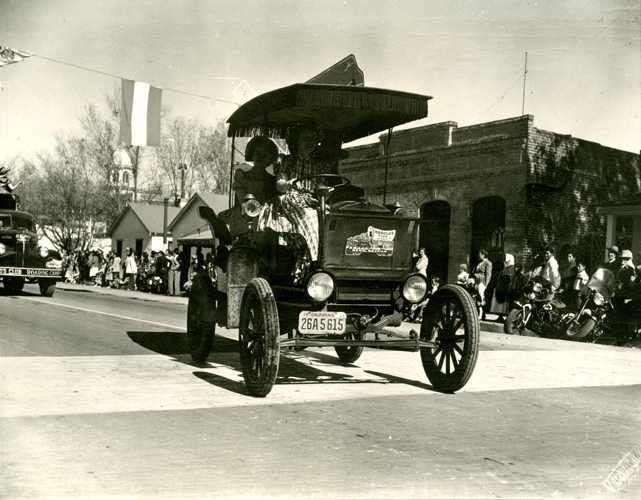 Antique automobile at an Admission Day parade in Carson City, Nevada, 1950. Also included in that year's Admission Day celebration was a pageant displaying important events in Nevada history. The pageant script was written by well-known Virginia City writers Lucius Beebe and Charles Clegg, and was narrated by former Hollywood star Gareth Hughes. Horse-drawn wagon at an Admission Day parade in Carson City, Nevada, 1950. 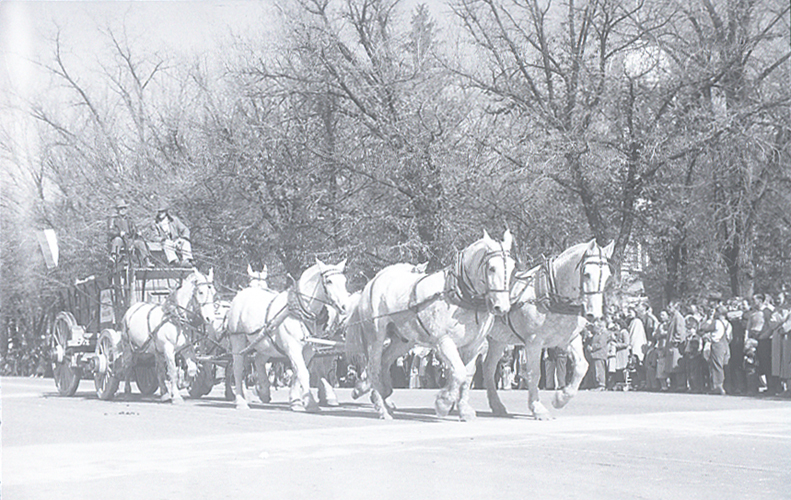 Included in that year's parade were four horse-drawn wagons, including wagons for logs, ore, and freight, and authentic prairie schooners. 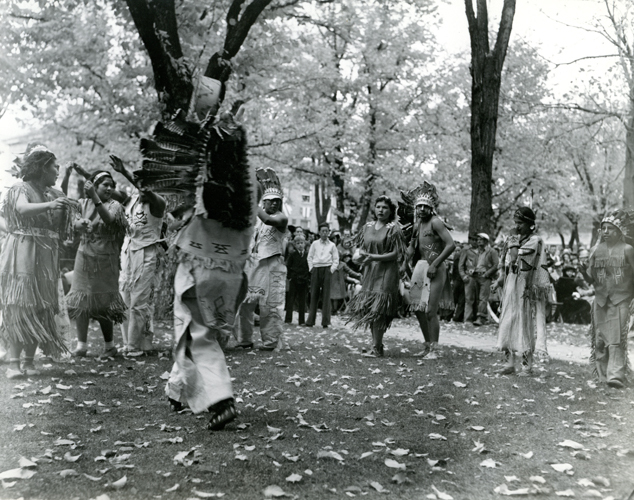 Native American dancers at an Admission Day parade in Carson City, Nevada, 1950. Starting in 1946, an open house ceremony at the Governor's Mansion has been a regular part of Nevada's Admission Day celebration. During this event, the governor invites the public to freely tour the Carson City estate. 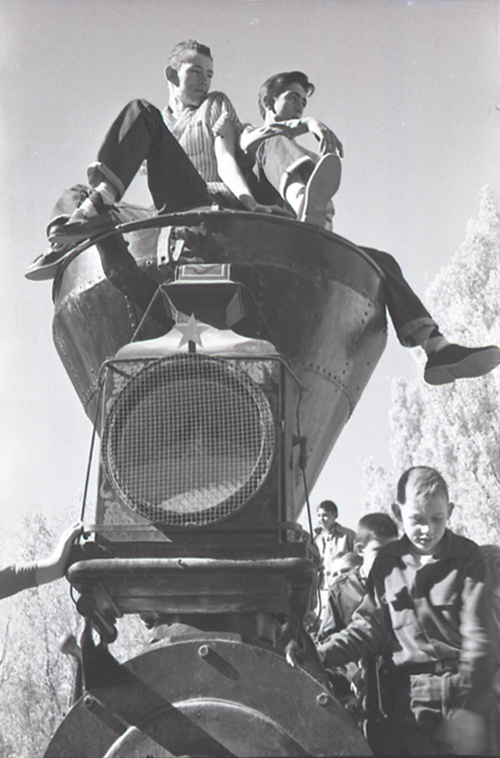 Two men sitting atop a steam locomotive float at an Admission Day parade in Carson City, Nevada, 1953. This float was entered into the parade by Frenchy Gilbert of Mineral County and was considered one of the more unique floats in the event. 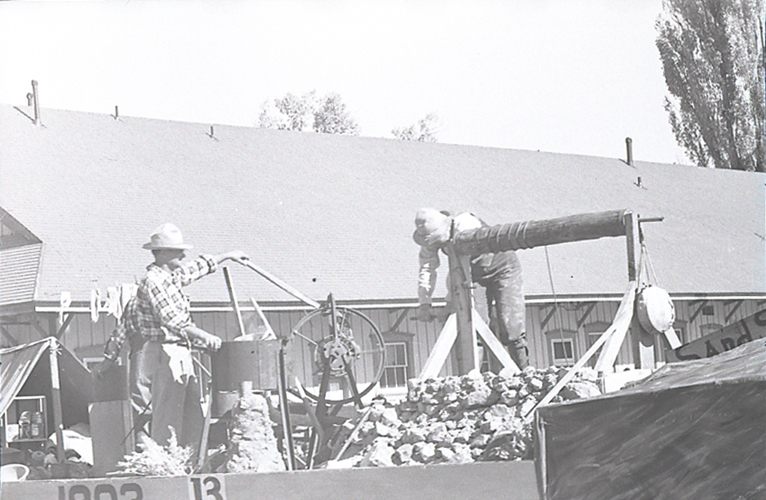 Mining-themed float at an Admission Day parade in Carson City, Nevada, 1953. The parade that year had 178 entries, including 27 marching bands. Over 50,000 people were in attendance. 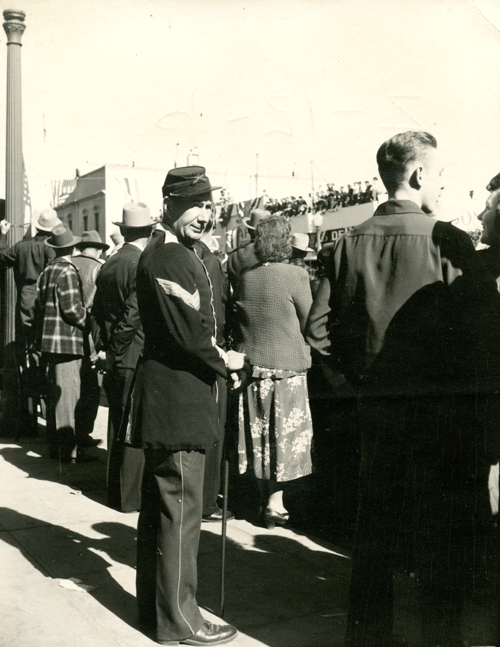 Man watching an Admission Day parade in Carson City, Nevada, 1953. Also included in that year's festivities was the 1864 Costume Ball, where over 600 men and women arrived at the Carson City Civic Auditorium in period attire. 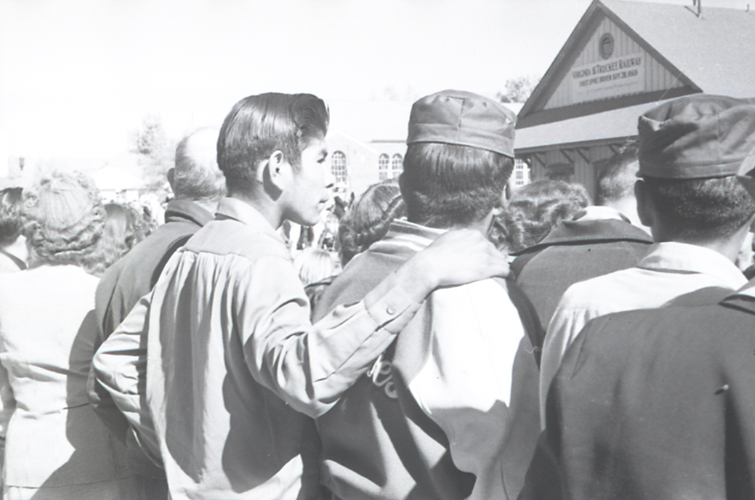 Men watching an Admission Day parade in Carson City, Nevada, 1953. Two other special features of the celebration that year were the Indian Fair and the Indian Parade. 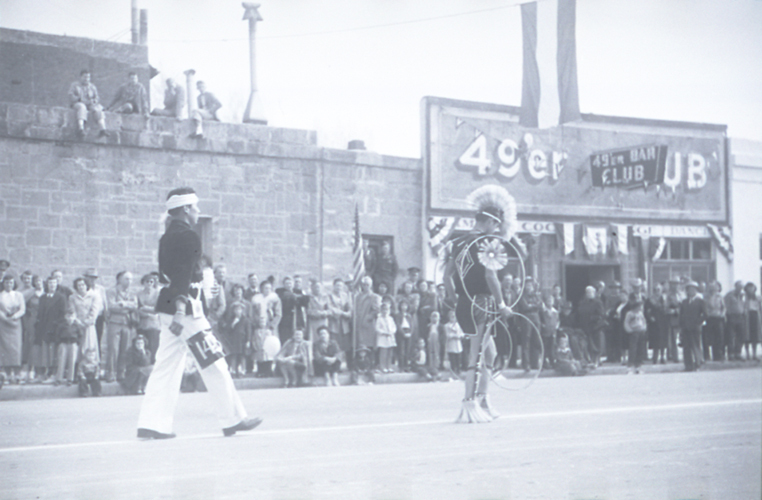 There were over 200 participants in the Indian Parade, including Native American veterans from each branch of the Armed Services. 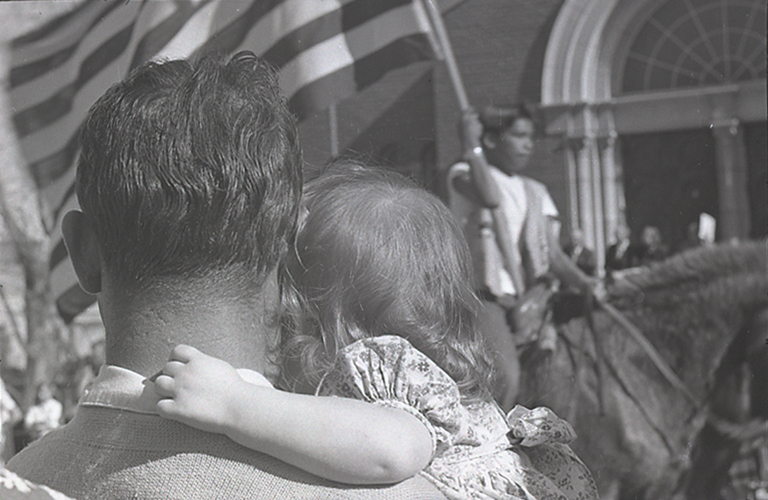 Man with young girl watching an Admission Day parade in Carson City, Nevada, 1953. Another event of the 1953 celebration was a music festival, featuring high school bands from throughout the state. 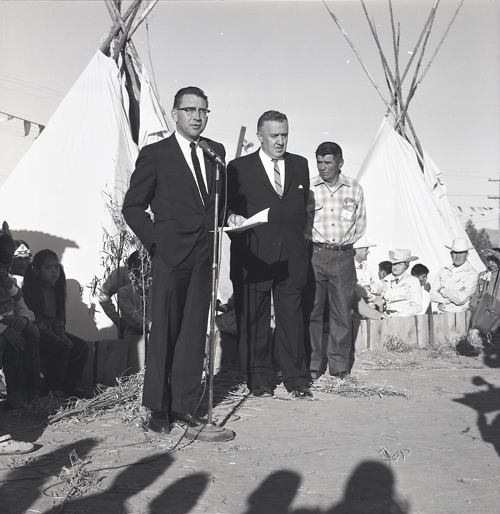 Governor Grant Sawyer and Representative Walter Baring (left to right) at the Centennial Admission Day celebration in Carson City, Nevada, 1964. The three-day Centennial celebration featured speeches, concerts, presentation, exhibits, and parades. 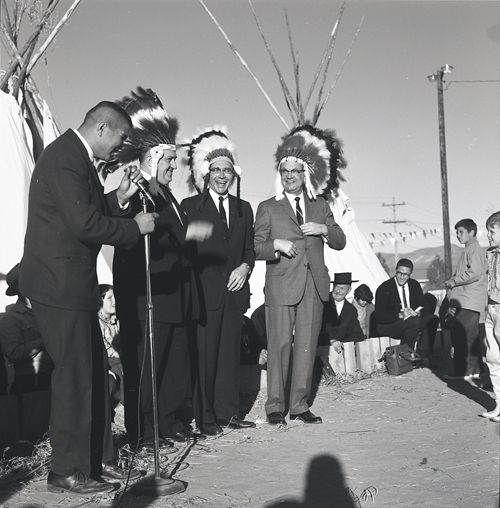 Representative Walter Baring, Governor Grant Sawyer, and Senator Alan Bible (left to right) wearing Native American headdresses at the Centennial Admission Day celebration in Carson City, Nevada, 1964. The Centennial festivities set a record for attendance and included appearances by prominent Nevada politicians and celebrities such as the cast of Bonanza. 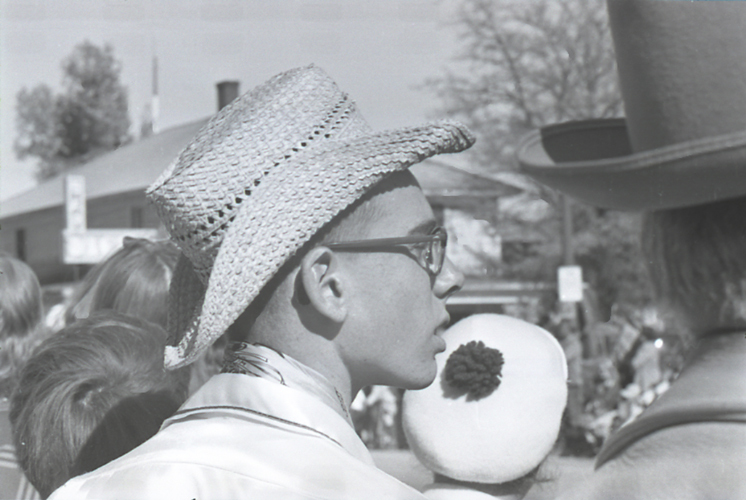 Crowd watching a Centennial Admission Day parade in Carson City, Nevada, 1964. The Centennial celebration featured three parades: the Indian parade, the children's parade, and the main spectacle. The main event last over three hours and featured over 3,300 participants. 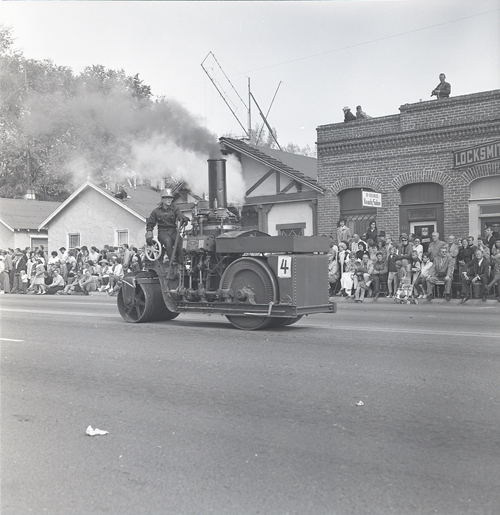 Steamroller featured in a Centennial Admission Day parade in Carson City, Nevada, 1964. The Nevada Heritage Foundation paraded eleven steam-driven vehicles in the Centennial celebration. 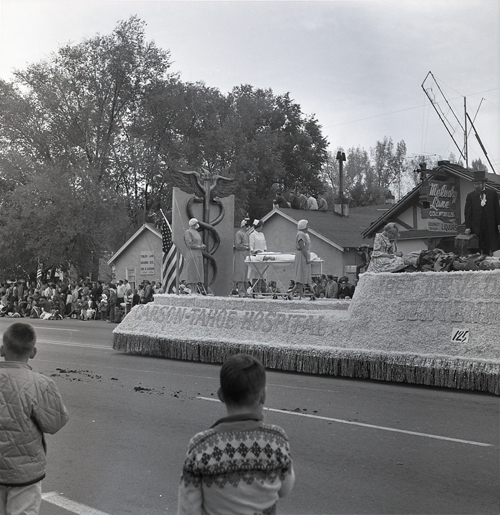 Carson-Tahoe Hospital float at a Centennial Admission Day parade in Carson City, Nevada, 1964. 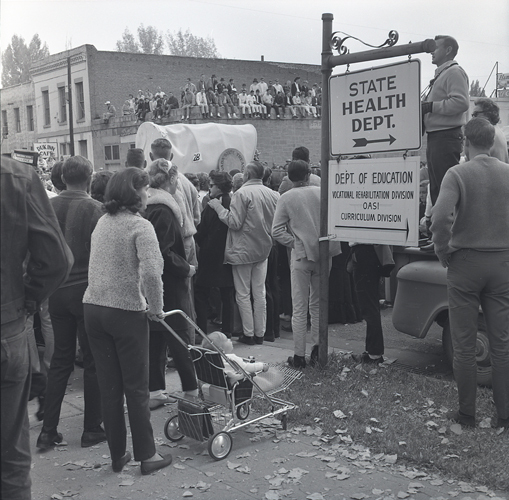 The float, displaying both new and old medical equipment and treatments, won the governor's trophy that year. 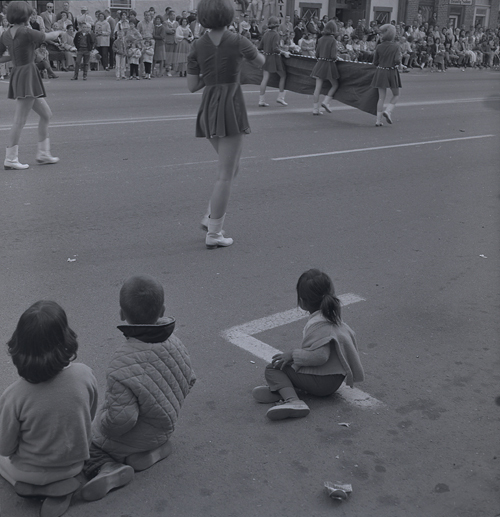 Group of children watching a Centennial Admission Day parade in Carson City, Nevada, 1964. The Admission Day festivities capped an almost year-long observance of the state's 100th birthday. 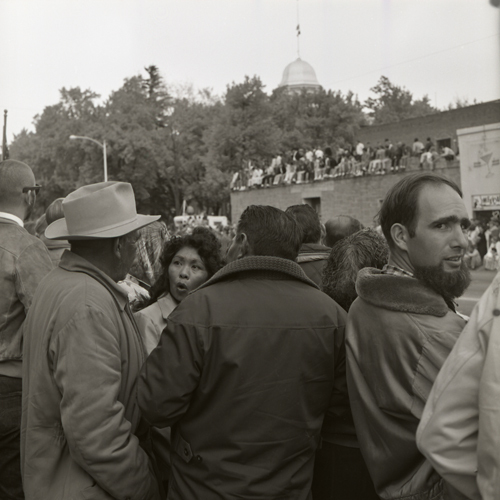 Crowd watching a Centennial Admission Day parade in Carson City, Nevada, 1964. Included in the many events at that year's Centennial celebration was a "whisker contest," where judges voted on who had the blackest, reddest, longest, and best overall beards.